When I was looking for a great yellow cupcake recipe to use with my Bailey’s Irish Cream Frosting, I turned to the internet with some trepidation. It’s happened before folks – I’ve tried recipes that promised to be “yummy” and the “best” and “perfect.” And not just from home cooks and blogs, but from professionals…and *gasp* they haven’t all lived up to what’s been promised. This time, I came across a very interesting blogger at Laura’s Sweet Spot where she took the time to make multiple yellow cupcake recipes and compare them – and describe them all. Bless her heart! I settled on the adaptions she gave for an Ina Garten Coconut Cupcake. Laura converted Ina’s recipe to her own Vanilla Cupcake so she could truly and fairly make her comparisons. So for St. Pat’s, I converted the recipe just a bit more. Not much, though, I just used a good shot of Irish Whiskey instead of the vanilla. Of course, you can make this a basic yellow cupcake by using the vanilla instead. These cupcakes are truly marvelous – rich and soft yet sturdy, but still moist and they held together perfectly when eating. Nothing’s worse than a cupcake that’s dry or one that’s not strong enough to hold up to however much frosting you’d like to pile on top. These are sweet, but not too sweet, and had a beautiful, slightly domed top. The better to pile on the frosting, my dear. Maybe it’s my roots, but I really liked the Irish Whiskey in this recipe – I couldn’t really taste it per se, like I had hoped, but I think it gave a little something to the flavor of the cupcake. Could be my imagination running wild, but it seemed a bit richer, a bit rounder than the more expected vanilla flavor. Pure vanilla can be pricey, too, so I like to try other alcoholic flavors from time to time. By the way, Vanilla is a vanilla bean who’s flavor has been extracted by alcohol. I used my 1/3 cup sweep scoop to measure the batter and came out precisely with 26 cupcakes, minus a swipe or two of batter for the cook. I couldn’t help myself, it was so beautiful and fluffy. I was a bit bummed about the two extra, but the recipe was so good I think it was worth the extra bake time. In the bowl of an electric mixer fitted with the paddle attachment, cream the butter and sugar on high-speed until light and fluffy, about 5 minutes. With the mixer on low-speed, add the eggs, 1 at a time, scraping down the bowl after each addition. Add the vanilla and mix well. In a separate bowl, sift together the flour, baking powder, baking soda, and salt. In 3 parts, alternately add the dry ingredients and the buttermilk to the batter, beginning and ending with the dry. Mix until just combined. Line a muffin pan with paper liners. 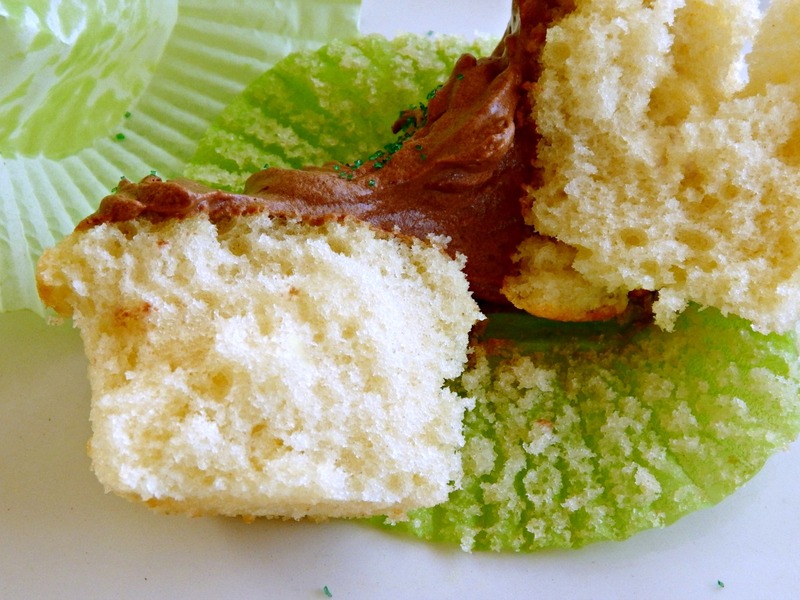 Evenly fill 2 dozen cupcake liners ⅔ full and bake 18-20 minutes. Allow to cool in the pan for 10 minutes. Remove to a baking rack and cool completely. Note: using 1/3 cup scoop, I made 24 cupcakes with enough batter left for two more. I’ll also be bringing this recipe to Fiesta Friday 111 hosted by Angie and cohosted this week by Naina @ Spice in the City and Julianna @ Foodie On Board, as well as Freedom Fridays, What’s Cooking Wednesdays & Weekend Potluck. This entry was posted in Click here for Fabulous Food Posts and tagged Alcohol, Cake, cupcakes, Freezes Well, Frugal Hausfrau, Ina Garten. Bookmark the permalink. Your cupcake looks PERFECT !! Isnt it great when someone has done all the hardwork and posted the perfect basic recipe 😀 I will be giving these a try soon, they look so good! Thank you for sharing at Fiesta Friday!! I know I’ve tried many cupcakes over the years and might have a recipe at my house that I decided was good (I’m at my folk’s helping out, and besides I pretty much got “over” cupcakes with all the cupcake shows that have been on in the past few years) but I really, really had dreaded trying to find a recipe until I saw and read Laura’s comparison! It doesn’t make sense, but its not easy to find a “wow” recipe for basics like plain chocolate cake or these yellow cupcakes. Without tons of add ins, the cake itself has to be the right texture and flavor. It sounds like Laura did her homework, and you found a winner! They were just perfect and Laura was absolutely right!! I have been looking for the ultimate brownie recipe. Do you have one I can try? Hi ltns! That’s a little subjective because it depends on what kind of brownies you like – or how it needs to be dressed up to be called YOUR ultimate. Here is my all time fave brownie, and guess what – it’s called the ultimate brownie, lol! I LOVE this brownie!! I’ll be making this one and I am sure it’s gonna be ultimate! Many thanks! Happy Friday! I wish I were in the cities, I’d be over for one, lol!! Everyone needs a good basic yellow/white/chocolate cupcake recipe. I’m not much of a drinker but I decided to use up an unopened bottle I found in the cupboard. You can’t taste the alcohol but it makes a nice vehicle for the vanilla beans. Delicious. Perfect timing too, I’m on a look-out for a great cupcake recipe for my daughters birthday coming up! I think these would be perfect – especially if youngsters are involved because they’re so perfectly behaved! The cupcakes, I mean, not necessarily the youngsters, lol! Ha, you’re so right. Everyone loves a boisterous 3 year old……. Two and three were my favorite years with my kids! I hope she has the most wonderful birthday! !